On this episode of The Laws Style, Fashion Lawyer, Douglas Hand’s guest is storied designer Yeohlee Teng. Yeohlee moved to New York from Malaysia to study fashion at the Parsons School of Design and established her own house, YEOHLEE inc in 1981. Teng discusses the spatial relationship of clothing to its wearer, gender fluid fashion, sustainability, the benefits of having a storefront, and current challenges with the New York City Garment District. 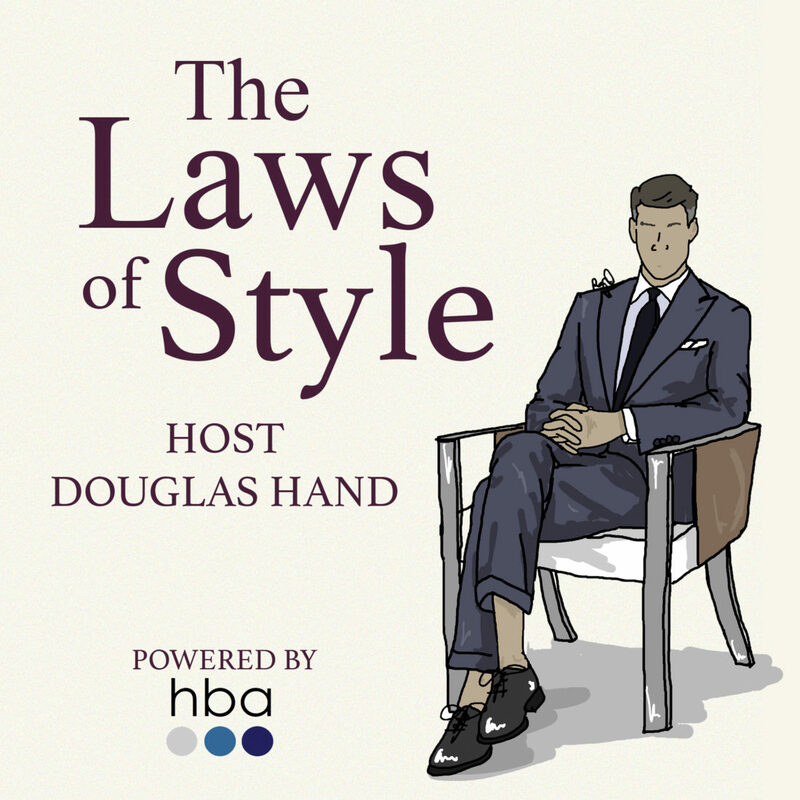 On this episode of The Laws of Style, Fashion Lawyer Douglas Hand is joined by John Bartlett. John is a NYC based CFDA award-winning fashion designer, vegan, animal lover/activist, yoga devotee, gay rights enthusiast and good midwestern boy! On the episode they discuss the current state of unisex fashion, the continual relevance of preppy style and the wisdom of never selling your trademark what it happens to also be your name We hope you’ll tune in, listen and watch this latest episode of The Laws of Style. Partner Douglas Hand offers his expertise in a WWD article about Off-White’s suit against children’s apparel company Brooklyn Lighthouse for trademark infringement. Check it out below! Learn more about Women’s Wear Daily. Learn more about Douglas Hand. 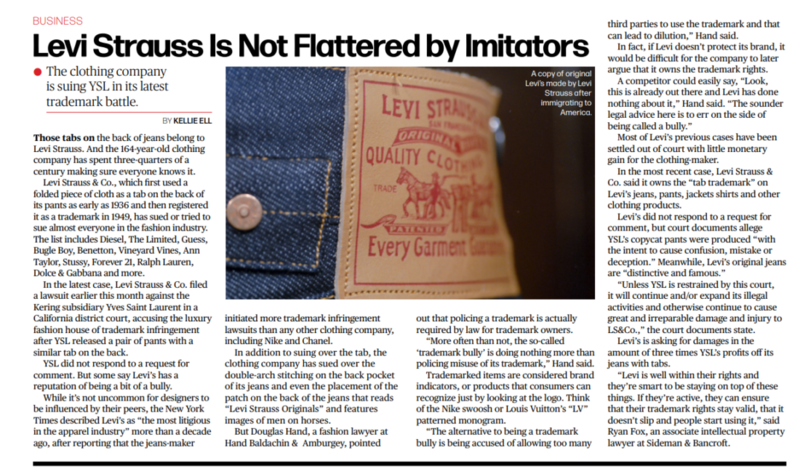 Partner Douglas Hand weighs in on the trademark battle over Levi Strauss and their signature tab on the back of jeans in a new piece featured in Women’s Wear Daily. On this episode of The Laws of Style, Fashion Lawyer Douglas Hand sits down with designer, archaeologist, and US Team rower Jack Carlson, the Renaissance man behind the exciting new label, Rowing Blazers. Jack and Douglas discuss Jack’s experience as a Bronze Medal winning U.S. Men’s National rower, obtaining a doctorate in archaeology from Oxford University, and how these experiences have inspired his design. Jack also provides a glance into his day-to-day at Rowing Blazers, discusses how he’s been able to tap into both the traditional menswear and streetwear markets, details upcoming Rowing Blazer’s collabarations, and much more. If you enjoyed the podcast, kindly like the video, subscribe to our channel on YouTube, and the audio podcasts on iTunes. To stay up to date on The Laws of Style and the industry insights it provides, follow Douglas on Instagram and Twitter at @HandoftheLaw, and Douglas’s firm, Hand Baldachin & Associates at @HBAlawoffices and @HBAfashion. Podcast Episode 1 Now Live and On Our New Channel! Fashion Lawyer and Law Professor Douglas Hand interviews inimitable designer Willy Chavarria about his burgeoning eponymous brand, the distinction between fashion and style, streetwear activism, and more. If you enjoyed the podcast, be sure to give a thumbs up and subscribe to the channel for more intimate conversations between fashion industry leaders.